From Mediaite: Lawyer, professor and political commentator Alan Dershowitz stopped by America LiveWednesday afternoon, where he shared his thoughts on the George Zimmerman case with host Megyn Kelly. In a nutshell: He thinks the case has gone to hell in a widely-publicized handbasket. Specifically, he believes that, if anyone should be tried in this case, it should be Special Prosecutor Angela Corey. Read on about what he had to say here. From Gossip Cop: Britney Spears’ fiance Jason Trawicki is now officially her co-conservator. On April 6, the pop icon’s legal team filed a petition to make Trawick a co-conservator, and now Gossip Cop has learned the judged just signed off on it. Spears’s father, Jamie, who was already one of her conservators, was strongly behind the move to have Trawick involved in how the singer’s finances and deals are handled. Gossip Cop confirms the story here. 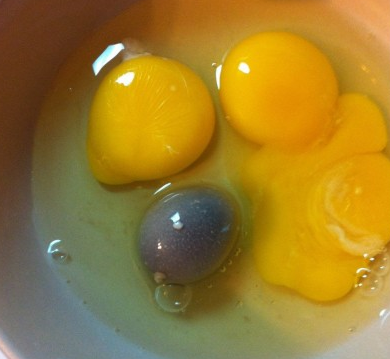 From Geekosystem: This lovely mystery thing pictured at left came out of an egg. Take a guess at what you think it might be, then head on past the break for what one Poultry Scientist — which is also somewhat of a mystery thing — thinks it is. 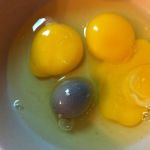 This picture was posted in the fitting WTF subreddit, and a swift response by redditor ChIck3n115, who claims to have a degree in Poultry Science, provides a fairly believable theory on what the odd item could be. Read it here. From Styleite – a slideshow: Lauren Conrad is something of a hair hero. Her locks are just so shiny and bouncy, plus she’s fearless when it comes to tonsorial experimentation. Her latest hair feat? Hot pink tips, or “Fuchsia Barbie.” Check out her pink pony (and all of her other dyed ‘dos) here. 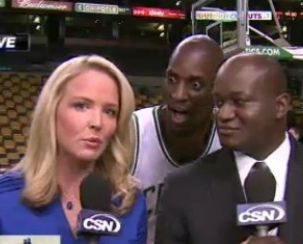 From SportsGrid: Kevin Garnett videobombs reporters. Is Garnett feeling all right? First he characterized media coverage of the Celtics as “pathetic” and “lousy” after the Celtics won their fifth consecutive Atlantic Division title (“Never count us out,” he said. “I mean, you guys called us old, over”). Then, after Garnett delivered that tirade, the Celtics played an absolutely miserable game against the Heat (they won, though). 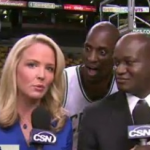 Watch Garnett in a cameo of sorts after the game in this video. 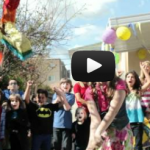 From The Mary Sue: Thinking of having a Batman birthday party? As any Batman fan will tell you, there’s a wide selection of Batmans to choose from for all your Batman needs. As to how many of them are fit for a kid’s birthday party, well, I’d got with Adam West! Batman, The Brave and the Bold! Batman, or maybe even George Clooney! Batman. Just… not All Star Batman and Robin! Batman. Definitely not him. Why? See for yourself here. From the Jane Dough: A team of scientists in has named an 18-year-old in the U.K. “the most beautiful” woman in the nation. This team of Greek scientists has found what it considers to be the ultimate in criteria for attractiveness, based on a painstaking study of facial symmetry. And, after applying said criteria to a pool of 8,000 applicants, it’s named 18-year-old Florence Colgate the most beautiful woman in Britain, in a contest sponsored by yes, a cosmetics company. Read the full post about it here.